What do you call that “thing” around your neck? What do you call that “thing” that hangs on the chain around your neck? Do you call it a slide? A pendant? 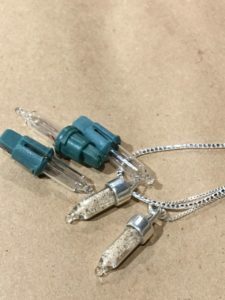 A necklace? A bezel? Me, I never know what to call my handmade pendants. 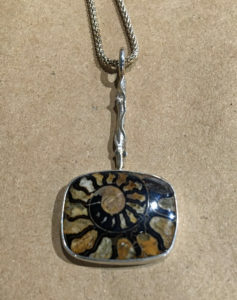 Julie Sanford calls her pendants that are purchased alone a “slide”. Her reason is that she wants you to be able to dress it up or down on a cord or with a chain. We have four artists who create jewelry for us – Casey Bemis, Cindy Edgerle, Julie Sanford, and Lochlin Smith. Each jeweler has their own style.